Did you say ‘free book’? NOTE: This offer has passed, but there will be more for the next book …. stay tuned. 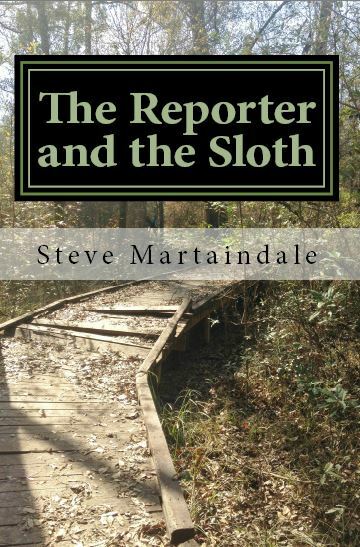 Would you like one of the first copies of “The Reporter and the Sloth” … FREE? Here’s the deal. Much of the “Sloth” story takes place on a hiking trail (Did you figure that out from the cover?) near Oldport. For an opportunity to receive a personalized, autographed paperback, create a post on JP Weiscarver’s Facebook page that includes a photo you took in the great outdoors. If you’re not familiar with JP Weiscarver, where have you been? He is the lead character in my book series and he has his own Facebook page. Go there, like the page and then post your photo. The photo can be from a hike, a day at the beach or the sunset from your front porch, as long as you took it and it’s outdoors. Feel free to include one sentence of explanation or description. Who wins? I don’t have any specific judging criteria other than to say I’ll award at least one prize to someone whose photo moves me. Is there a deadline? Of course there is; I’m a reporter and I know nothing happens without a deadline. Get your photo posted by noon, CDT, on Saturday, March 14. But you know how you tend to forget things, so you really should do it now. And, while I have your attention, like this post. Doing so certainly wouldn’t make your photo less moving.